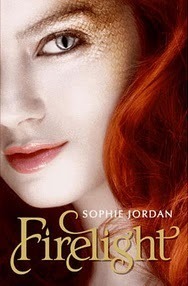 Firelight is one of those books which I really enjoyed because it was effortless to read, with a host of interesting characters, an engaging storyline and most importantly of all was that it had its own unique take on the YA paranormal romance genre. Jacinda was really interesting character as she is forced into a situation which is both put on her to save her from something really horrible but also one that starts to tear her up from the inside out forcing her to be something that she isn't. I quite liked seeing how she struggled to come to terms with that she had to do to save safe and what she wanted and needed to do to stay sane. I wasn't wholly convinced about the relationship between Will and Jacinda and I suppose that's because it was an attraction due to instinct rather than anything else which left me feeling that I didn't really know Will enough to feel a great deal about him either way. I am hoping future books remedy this so that I can love him a bit more. The ending did annoy me quite a bit as it left me on a huge cliff hanger which was excruciating. I would have preferred the author to have written a few more pages just to round the whole thing off a little bit more leaving me with the feeling that I'd come to a bit more a satisfying ending. Don't get me wrong this is a series that I am very interested to continue and I am hoping that it'll turn out to be awesome but at the moment I am very much left a lot of unfulfilled hopes and dozens of questions which I will need answering before I am fully convinced. This series really intrigues me, but I have no overwhelming desire to read it. I think I just need to give it a shot! I loved Firelight and I'm glad you mostly enjoyed it - I 100% agree about the writing! I'm really curious about this book. Which is odd because when it first came out I had zero interest in it. Now I really want to read it!